Can’t even cook American food right…. a low simmer turned into a broil…ayayay! As I put down the 2 year old for bed, I walked back into the living room to my 3 year old saying ” Eew *cough* nah-tee” as he held his little nose..and I saw a cloud of smoke coming from the kitchen. 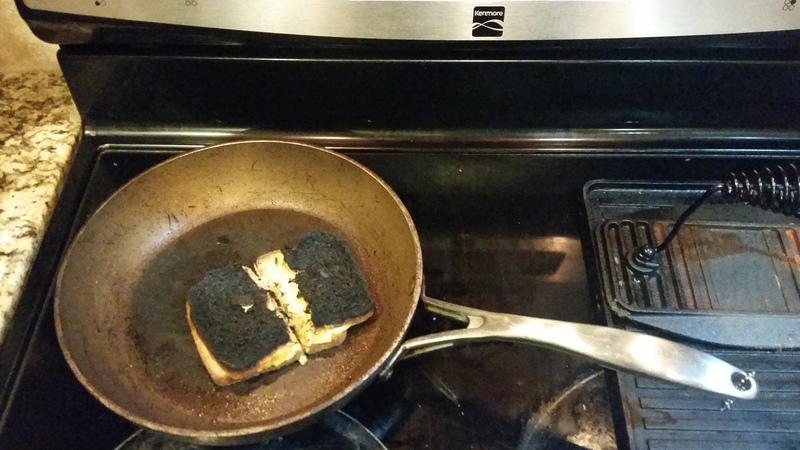 I hobble-ran over to the stove (I say “hobble-ran” becuase I’m still not fully recovered from a bad ankle break just a little over a year ago) to find my #EsposaFail for today…the simple grilled cheese I was making myself for dinner was burnt almost to a complete crisp. Although the cheese was still in good shape, I don’t think I could’ve stomached the taste of charcoal-like bread. Pos, A LA BASURA! But mijo was curiouis was to where Mami was running, and so as I turned towards the trashcan, I bumped into him and “plop!” went the grilled cheese charcoal sammich to the ground. My dogs quickly surrounded it like a piece of carne asada (because that’s probably what they thought it looked like). Maybe I should have taken that as a sign to make a salad instead. But nope. The Esposo came home with donuts and I ate two whilst snuggled on the couch watching Netflix. So I had an Esposa and diet fail…but a win for deliciousness!